My hubby’s birthday was last Wednesday. It was an interesting birthday to say the least. But it wasn’t actually much of a birthday. And even though it’s a long story, I’m going to share it. I’ll try to keep it short. It’s just too crazy – sad, funny and happy all at once! So bear with me. Hopefully it will give you a good laugh. If you have a weak stomach though, you may want to just scroll to the recipe. You’ve been warned. So last Monday night (a week ago), the hubs and I got home from work to find our sweet lab had had an awful day. She must have gotten some kind of stomach bug and she had diarrhea and vomited all over the pen she stays in while we’re gone (it’s about 6 feet wide, circular). And the pen was on the carpet. In our bedroom. Now normally it’s in a different room, but because our family had been visiting, she was still in our room for the day. There was poop EVERYWHERE! No actually, not poop. There wasn’t anything solid enough to be called that. It had just soaked into the carpet. And she was covered in it. The poor thing. She had been trying to get out all day. We felt awful. The hubs hopped in the shower with her while I tried to clean up the mess. The next day, I called in the professionals. Carpet cleaners, that is. I figured this was a job for those that knew what they were doing. Our dog was fine, but I was scared now for our carpet. In fact, he said, they’d recommend we just replace it altogether. They could clean it, but there’d probably still be stains and maybe even a smell if it got into the padding. I appreciated his honesty. He put down some kind of enzymes that would help with the smell at no charge and went on his way. Bummer! We’d be spending our second night sleeping in the guest room and our weekend looking at carpet. Fantastic. Wednesday – the birthday – rolled around. It had been 24 hours so the enzymes needed to be vacuumed up. This is where it got really fun. We pondered what to do. Should we actually vacuum this poo infested enzyme stuff up with our home vacuum? Instead, the hubs came up with an idea that only a man would think of. The only problem, he said, was that the bag on it is fabric and tends to let a lot of dust out. The solution? Tie a plastic trash bag around the outside of the fabric bag and let that catch the poo dust. He went into the closet and came out wearing a ski mask and ski goggles. I almost died right there. The sight of my husband on his birthday leaf blowing/sucking our bedroom poo infested carpet with ski goggles and a ski mask on was too much. If it hadn’t been his birthday, I would have taken a picture and posted it on Facebook. He would have hated me for it though. Haha. But everyone I’ve told this story immediately asks if I took a picture. I’m sorry, but I didn’t. It was my birthday present to the birthday boy who for his birthday quite literally got poo in the face. I won’t bore you with the details of the rest of the story. I will just tell you that I had a lot of poo dust to clean up this weekend and after buying about $50 worth of pet stain remover (with a battery powered gun – no hand cramps for me!) and getting on my hands and knees for I don’t even know how many hours, I got most of it up. There were still stains though and I thought we’d still need to replace the carpet. Then I rented the rug steam cleaner from Home Depot for $30 and miraculously I seem to have gotten it all up. The only problem is now I want to steam clean everything! I’d never used a steam cleaner and wasn’t sure it could do much more than I’d already done, but I was wrong. With every run over those spots, it got better and better. I think I’m obsessed now. I want to steam clean our entire house. Lindsay – 1, Dog poop – 0. After almost a week in the guest room, we finally got our king sized bad back last night. Man, I missed that thing. So the stain appears to be gone. The smell is gone. And I am one happy camper. But since my husband got poo in the face on his birthday, I wanted to do something nice for him over the weekend. I considered making my Funfetti Cake Batter Pancakes since he’d been such a big fan. But as I was considering that, the lightbulb went off. 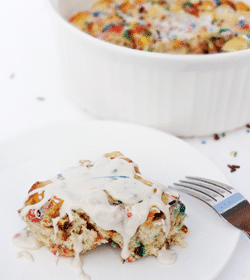 Funfetti Cake Batter French Toast Casserole! AND something else. But you’ll have to wait to find out what until a little bit later today. So Saturday morning we had a wonderful birthday breakfast. And by the end of the weekend, he also had a clean room to live in again. Happy Birthday to the hubs! 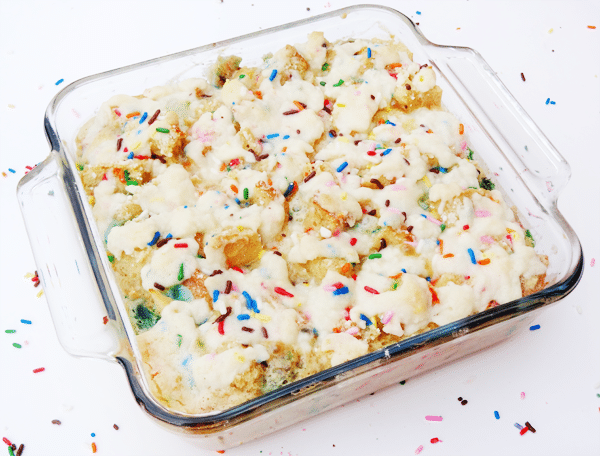 Here’s the recipe for the Funfetti Cake Batter French Toast Casserole. It is seriously a party in my mouth. 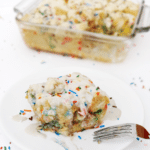 So french toasty and yet so funfetti cake batter-y at the same time. 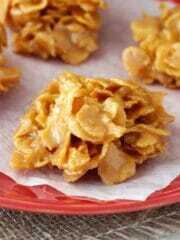 Also note that what is pictured is a half recipe but the recipe below is for the full casserole. Since there’s only two of us, a full recipe is just too much for us to eat. Unless we want to explode. 3. Whisk together eggs, milk, cream, cake mix, cinnamon, vanilla and 3 1/2 tbsp sprinkles. Pour evenly over bread. 5. In another bowl, add cake mix and butter for topping. Mash until it all comes together. You can store this mixture in the fridge overnight if you’d like. 7. Remove casserole and pre-made topping from fridge. Crumble pre-made topping and sprinkle over the top of the casserole. Sprinkle remaining 1 1/2 tbsp sprinkles over top of the pre-made topping. 8. Bake for 45 minutes for a softer, more moist texture. 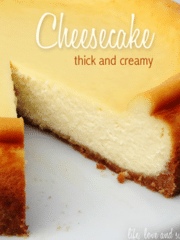 Bake an hour or more for a firmer, less moist texture. 9. 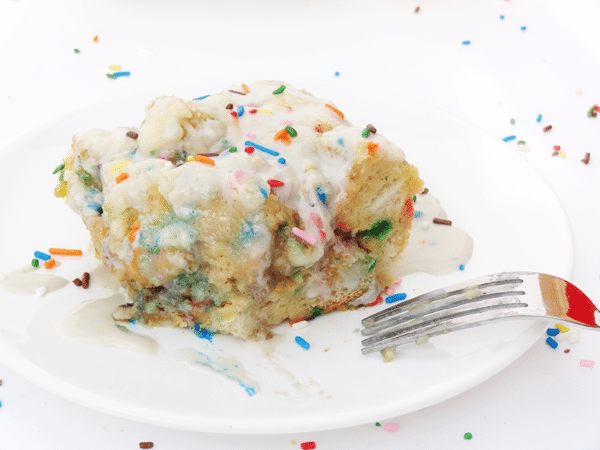 Serve with syrup or rainbow chip icing that has been warmed up a little to allow easy pouring. I am SO blown away! 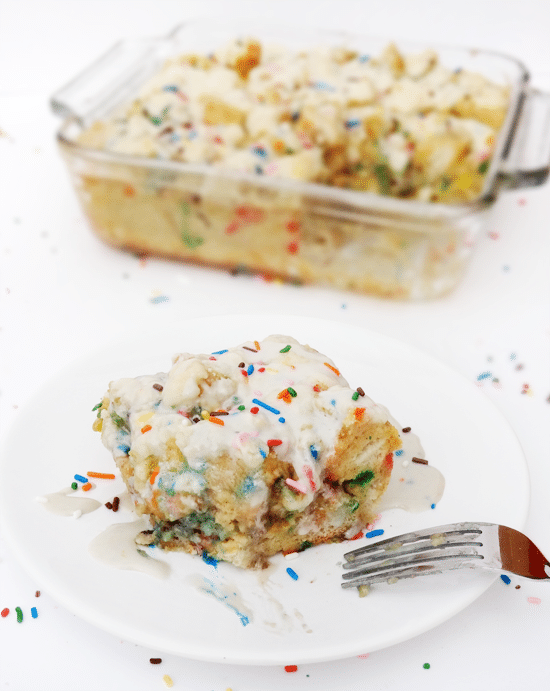 Any excuse and recipe to eat funfetti for breakfast is certainly something I can stand behind. Wow! And I love love love rainbow chip icing! Thanks Sally!! I totally agree. I could eat an entire tub of rainbow chip icing with a spoon. No problem. oh my gosh this story had me cracking up while still half asleep in bed! i could totally see my husband and i in the exact same situation. glad your pup is okay, and it sounds like the carpet too! i have never heard of french toast casserole before, but this sounds amazing! especially since it’s funfetti-ed out! i have only made funfetti waffles before, but i will have to remember this one! Thanks Carrie! I’m glad you got a good laugh! We definitely had to keep our sense of humor. I’m just hoping that as the carpet dries, the stains stay away! You should definitely try it. It’s so easy to make and delicious! The original cinnamon version can be found here. This is such a fun recipe! It looks adorable – if I were eating this, I’m sure I’d have a huge grin on my face the whole time. I’m super intrigued by the addition of the cake mix with the french toast. It sounds delicious so I can’t wait to try this recipe! Thanks! Let me know if you try it and what you think! Looking for something totally different and found this and laughed so hard I almost cried. SO happy to hear other people have this kind of crazy life too! I randomly found this while looking for a cake batter cinnamon roll recipe…we are more “french toasty cass” type peoples though, so glad to have found this recipe! I absolutely loved the story with it & your blog as a whole! Will definitely be back for more of your awesome recipes/a good read! 🙂 I am definitely going to have to repost this on my blog & link back! PERFECT recipe for my hubs welcome home breakfast! 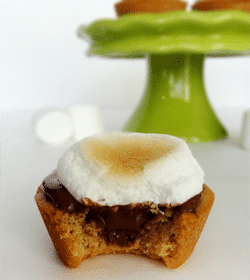 I’m so glad you found them blog and enjoyed the recipe! Definitely one of my faves! Thanks Cici! Your story is exactly “the something” that would happen to us…It’s even funner if you add FOUR kids to the mix! Warning: The Rug Dr. IS ADDICTIVE. I have to do it at least once a year now. Once you see what comes out of your carpet, you never really recover from it. I bought two steam cleaners, and one was a Kirby/steam cleaner and NONE works as good as the ‘ole Rug Dr. brand my mother used. As cheap as it is, it’s worth the money! (my sis was smart and has very little carpet). I am soooo making this for my dad’s b-day (day after Christmas) but my son’s b-day is the day before Christmas eve, and it is “kid-like” enough man, I might see if he wants to do it. (Ironically, he had me pick up funfetti cake mix…so I already have 2 boxes). This just looks so fun-fetti-yummy. By the way Happy Birthday! I read on you breakfast casserole page, that you are a Christmas-time baby..and this is your tradition! So it must be GOOD.